If you’re having trouble deciding between the 10 yard dumpster and the 20 yard unit, there is another option. Many Bin There Dump That franchises also carry a number of 15 yard dumpsters for rent. If you have lots of material you want out of the house, but you think the 20 yard option is just slightly more than your needs require this is the perfect choice. You can use a 15 yard dumpster to clean out your two car garage and the basement all in one clean out project. There’s a lot to be said for taking care of two problems at the same time. It’s even big enough for some commercial jobs, so if you want to make it easier for the contractors you’ve hired for a renovation to do their job this dumpster is a good way to go. What Does A 15 Yard Dumpster Cost? Depending where you are in the country, prices will vary. To be on the safe side, you should budget around $350-$500 for a 15 yard dumpster rental. The cost of Bin There Dump That's dumpster rental includes delivery, pick up, 7 days rental and our driveway protection system. Find your local Bin There Dump That to talk to one of our Dumpster Consultants to find out the price of a 15 yard dumpter in your area. What Size Is A 15 Yard Dumpster? 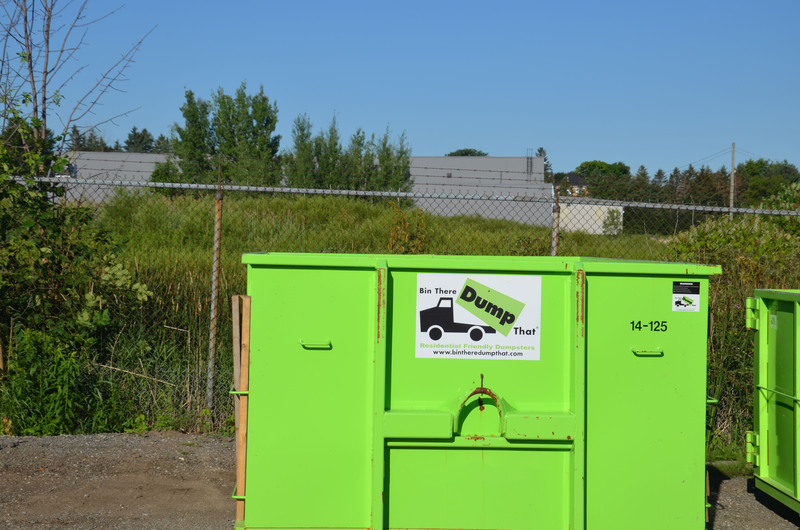 When we refer to a 15 yard dumpster, we mean that the dumpster is 15 cubic yards. The 15 yard dumpster is 11 feet long, about 5 feet high and 8 feet wide. This is a great option for medium to large projects. If you need a visual reference, you can see one here. How Many Tons Can A 15 Yard Dumpster Hold? A 15 yard dumpster can approximately hold 4,500 lbs to 6,500 lbs which in tons converts to 2.25 tons to 3.25 tons. Just a reminder when you're filling your dumpster to not fill it over the top as when we pick up, we tarp the dumpster so the waste does not fly out onto the streets when we deliver it to the local landfill. What Does A 15 Yard Dumpster Weigh Empty? A 15 yard dumpster weighs approximately 2,780 lbs. With a sturdy weight like this, this dumpster can handle anything you throw in it. There are really no limits to the type of home improvement projects you can use your rented dumpster for. It’s yours to use for a full week to dispose of any household waste as long as it’s not hazardous. You’ll have to contact your closest landfill location to find out how to get rid of that. Our 15 yard dumpster is a big container – it measures 11x8x4.5. The great thing is, it still fits in your driveway and we don’t need a lot of room to get it there for you. If a minivan can fit in that spot so can we. It’s called a roll off dumpster for a reason. The average family accumulates a lot of stuff over the years. Every Christmas and every birthday there’s something new. Most of us don’t mind that, but when it comes time for the kids to move away for college you’re left with many memories and a lot of junk you probably don’t need. When it’s time to downsize after the kids have left for good it’s better to get it all done at once. Sure, you could make several trips to the dump, but renting a 15 yard dumpster is a better option. You can fit all of those old things in one of these containers. We can generate a lot of waste outdoors as well as indoors. This is definitely the case when you’re in the middle of a major landscaping project you’re taking on yourself. You might have some great ideas for a new look backyard, but first you have to get rid of the old material. The 15 yard dumpster will hold the sod you removed for your new garden plots, the old fence you replaced, and the rotten shed that was wasting away in the corner of the yard. It’s a big dumpster with room to spare for most projects.